Bucket drumming is a really engaging activitiy for your music classes. It’s inexpensive to equip a classroom with buckets and sticks, and they are easy to stack and store, so bucket drumming is an activity that’s accessible to all. Buckets: What kind of buckets should you get? You can use all shapes and sizes of buckets. I’m fond of the sound that Costco laundry detergent buckets make. Ice cream stores sometimes give away large ice cream buckets. Home Depot and Lowes have 5 gallon buckets that they sell for $3.97 Canadian. If you take in a letter from your school requesting a donation, they may give them to you. (One teacher reported that the Lowes buckets don’t stick together) If you’d like to create a complete Bucket Drumming ensemble, you’ll want buckets of varying sizes. Sticks: You can use rhythm sticks, dowels or drum sticks to drum on the buckets. 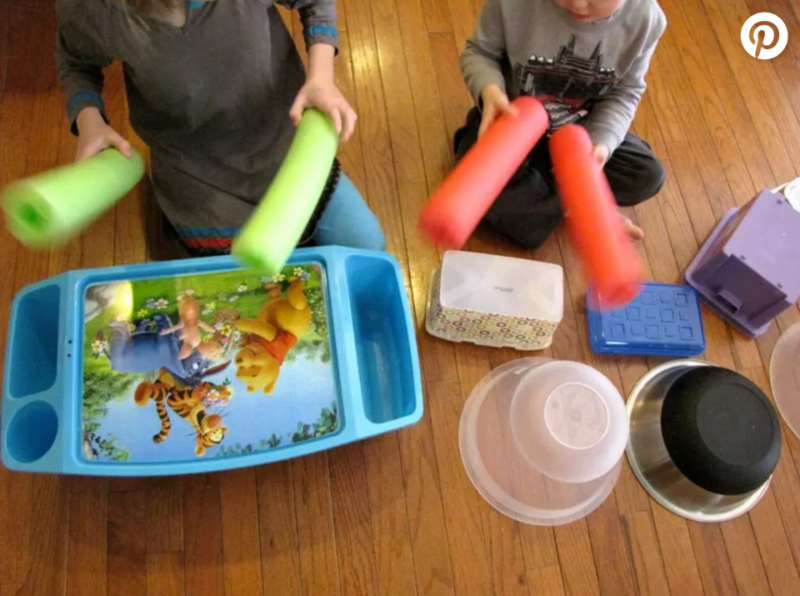 If the noise gets to be too much for you (or neighboring teachers) cut pool noodles into 12-14” lengths and drum with noodles. 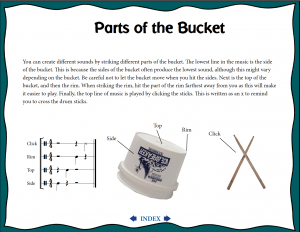 Resources: Easy Bucket Drumming is an excellent resource to start with. 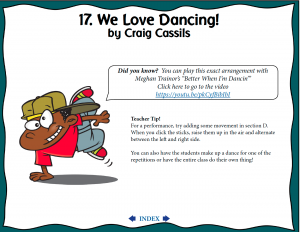 The resource includes a teacher’s guide, PDF projectables with embedded audio, MP4 videos of all 18 selections (no page turns!) and the audio recordings. It’s available as a Book/Disk resource and as a download. The projectables and embedded audio make this really easy to use in the classroom. 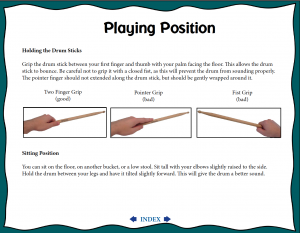 Hand Position: The first thing you need to teach the students is how to hold drum sticks. We illustrate in the projectable PDF the correct / not correct ways to hold the sticks. If you have Orff instruments, you’ll want the students to hold drum sticks the same way they hold their mallets. Parts of the Bucket: We illustrate in the projectable PDF the parts of the bucket that we’ll be playing on: sides, top, rim, click sticks. We’ve done the music notation in that order – it’s big, clear and easy to read, and makes logical sense. 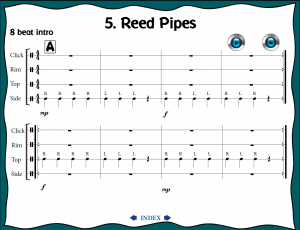 Our 18 exercises begin by teaching the students to read the notation playing on just one part of the bucket at a time. 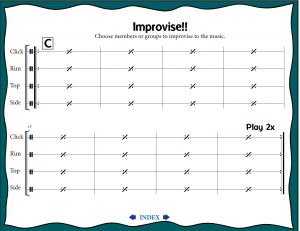 Even though the first exercises are simple, the accompaniment tracks make them fun to play! The first performance piece is Dance of the Reed Pipes from the Nutcracker. It’s simple, but a a very effective arrangement you could use in a holiday concert. To play along, just click the play button twice. OR – you can play the MP4 video so you don’t have to turn pages. What Grades/Ages can Bucket Drum? We taught the lessons in Gr. 3-6 classrooms, so ages 8-12. 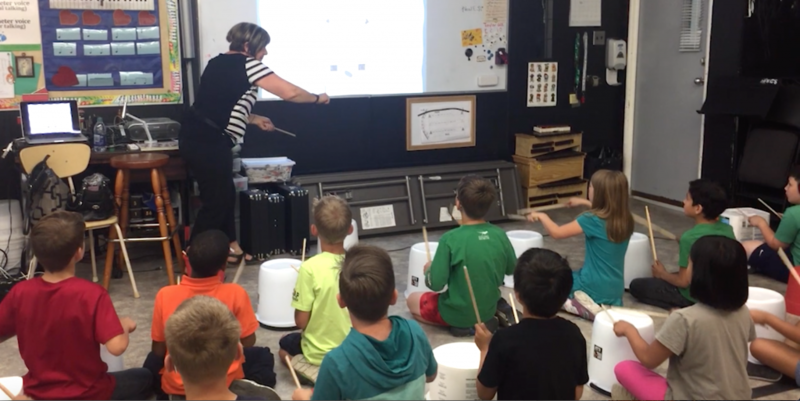 Younger students can learn to play bucket drums, but you’ll need to spend more time on each section. I find it harder to engage older students, so like to “save” something fun and different for the kids that are harder to engage. For that reason, I’d suggest saving bucket drumming as something special for your older kids. Alternately, the arrangements are so intuitive that your students could memorize them, and you could lead them through. Sticking: The sticking in bucket drumming is similar to the sticking on a drum set. Bucket drumming is great preparation for playing a drum kit. In this resource, we wanted to develop some hand independence. Bat Rap sets this up. Teaching the parts first with body percussion, then with sticks helped our students to be successful. We used body percussion to teach the Music Rules, then had the students transfer the body percussion to buckets. Improvising: Buckets are a great instrument to try improvising. In songs 11-14 opportunities to improvise are given. You could have the whole class improvise, but it tends to be very loud, so we suggest inviting smaller groups of students improvise and have them switch off with other groups. 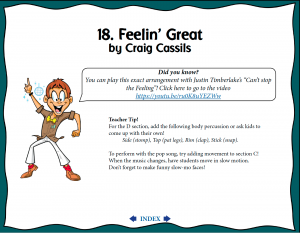 Pop Songs: Playing with pop songs is fun for the kids. Songs 16-18 are arrangements of original songs by Craig Cassils. 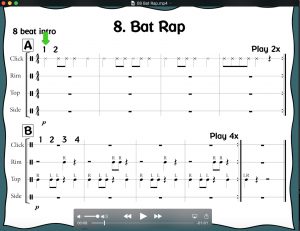 Teach these new arrangements using the Projectable PDF or the MP4 video. 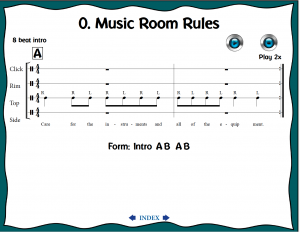 Then, go to the PDF one page form chart and you can play the same arrangement with a pop song. We can’t include the music for the pop song, but you can download on iTunes or play it on YouTube. 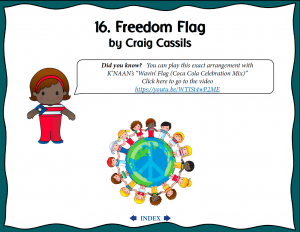 The 3 pop song arrangements included in this resource are Freedom Flag – can be played with Wavin Flag, We Love Dancing – can be played with Better When I’m Dancing and Can’t Stop the Feeling. Denise does workshops on many topics for elementary music teachers: PreK-6 curriculum, singing games, listening, recorder, creating/composing, ukulele and more! Denise has given workshops in every Canadian province/territory, and all 50 states. 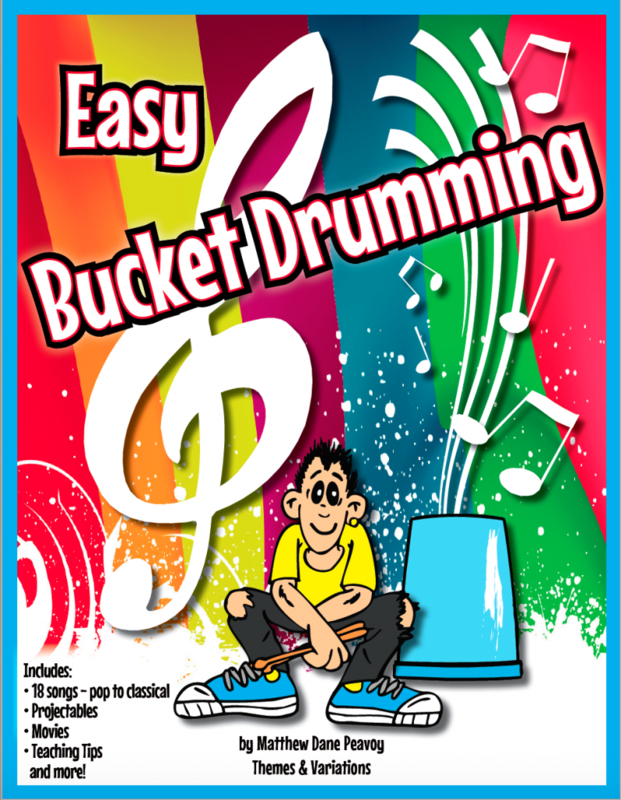 This entry was posted in Bucket Drumming and tagged bucket drumming, Bucket Drumming pop songs, Denise Gagne, easy bucket drumming, music lesson plans, Musicplay, musicplayonline on September 3, 2017 by Denise Gagne.